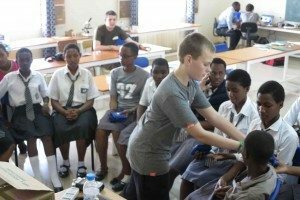 Students from Writhlington School have just returned from an expedition to Rwanda to work with FAWE School in Rwanda’s capital, Kigali, and the Kitabi College of conservation and Environmental Management. The students of the three institutions are working together to research the orchids of Rwanda and their habitats. Data logging is at the heart of this research and sixteen year old Aaron Rabbits has been leading training in using data loggers. This started with a workshop at FAWE school where Aaron introduced the activity ‘Take your Data-Logger for an adventure’ The image shows the students of FAWE getting to grips with the technology. Results and more photos to follow.